Ah, the warmth of summer! A check on the weather on the top of Mt. Washington this morning was sobering. Up there, at 6,288′ it was 32 degrees, with the wind holding steady at 52 MPH with gusts up to 80 MPH. GuthooK was up to Abram on August 8th, and wrote about it. Aislinn wrote about it this month in her One Minute Hikes. 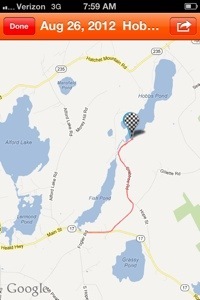 If you don’t know about the Maine Trail Finder, you should. Here is the link to the Fire warden’s trail on Mt. Abram– it’s all you’ll need to get there. It was my turn today, and what a day it turned out to be. It is only a two hour ride from my house to the village of Kingfield, where you veer off onto to West Kingfield Road and the navigating gets more interesting. You’ll be driving over 6 more miles of road, the last 3 gravel, washed out in places, but you can make it in a passenger car if you are plucky and drive carefully over the ruts. You used to be able to drive all the way to the trail head. Hurricane Irene washed out two bridges that are 1/2 a mile from the actual Firewarden’s Trail head, and there is no way a car can fly over a 10′ drop that is twenty feet wide. Here’s a 4 minute video of me getting back over the deepest wash out. The day was crisp, clear, and breezy. Perfect for hiking. I dislike humidity. This is a great hike. The trail is well-marked, and I was following a GPS route supplied to me by Guthook. The hand printed signage is a little confusing after crossing the second washed-out bridge, but just take the immediate right. There was an especially confusing brand new sign about a mile from the top that read “Appalachain Trail”, with the usual warnings about vegetation, etc. The real AT was more than a mile away skirting the side of Sugarloaf to the north. Someone made a mistake. The beginning is easy, gradual, shady, and with ample water. Just before the site of the former cabin, at the three mile mark at 2,100′ there is a strong stream where final drinking water can be accessed. This site now has an outhouse and several tent sites, for those who want to make an overnight out of this trip. From here it is 1.5 miles to the summit, with 2,000 feet of vertical ascent coming into play. The trail continues up in elevation, over the dwindling forest cover. 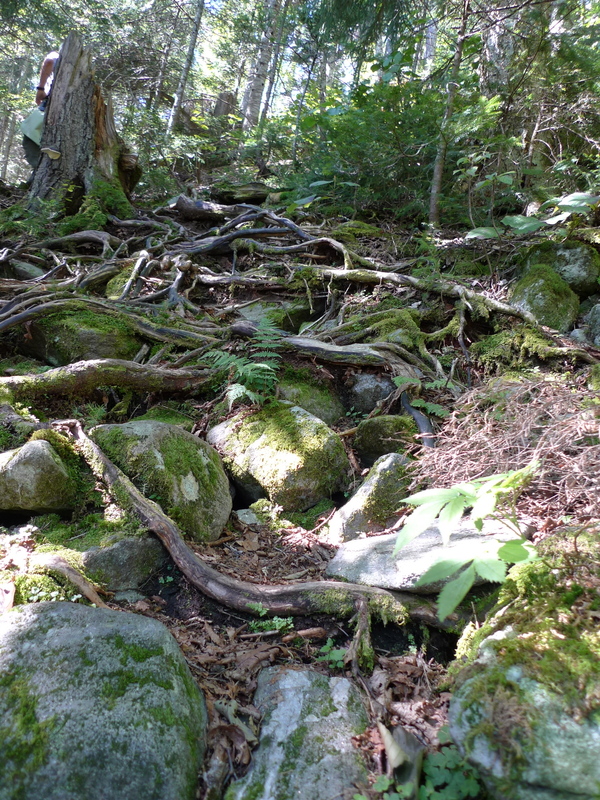 Lots of rock and roots to get over. Eventually you round a bend and there is the scree slope and rock scramble part of the hike. 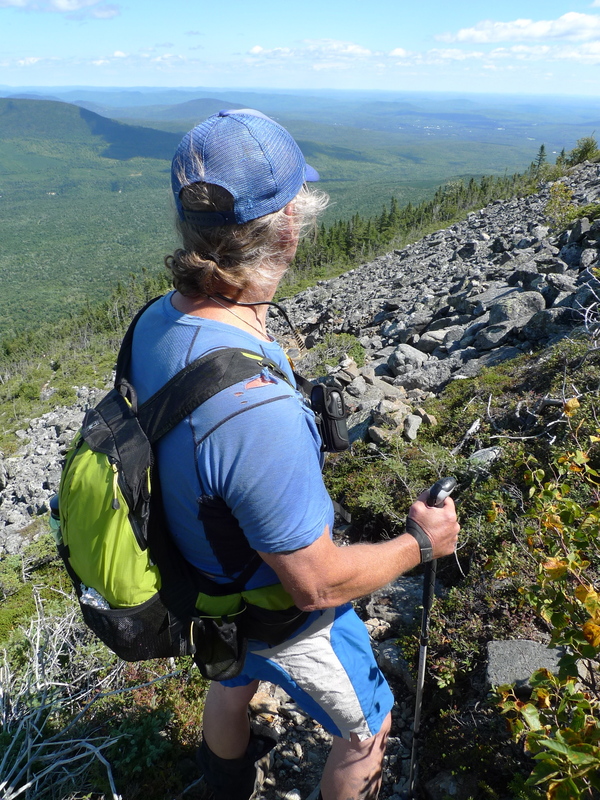 From the Maine Trail Finder: “The remaining half mile of the trail to the summit is a boulder scramble through the second largest alpine zone in Maine. At approximately 350 acres, it is second in area only to Mount Katahdin in the state. This section of trail is very exposed and can be dangerous in bad weather. The trail is well marked by cairns, but even the experienced and advanced hikers will need to pay attention as not to lose the trail, especially in bad weather. Accurate description. It was stunning up there. Regarding the “shelter”- It is a small “cave”, created from piled rocks, covered with tar paper and a tiny wooden roof, but one person can lay down in it, maybe two can squeeze in, and one could definitely spend a sheltered night on top. General Lee did it last year at this time and encouraged me to stay up there on this hike. I was back home just 12 hours after leaving this morning, and am still digesting this most rewarding hike, up high, here in Maine. As a concluding rant, I am truly baffled by the fact that I saw only two other hikers all day- both from New York, and concluding their New York/ New England peaks list. Had planned to go up today, but rain, within thunderstorms are socking us hard here in Maine right now. It’s going to be clear and sunny tomorrow with early morning temps in the 40’s following the cold front, so that’s the new plan. 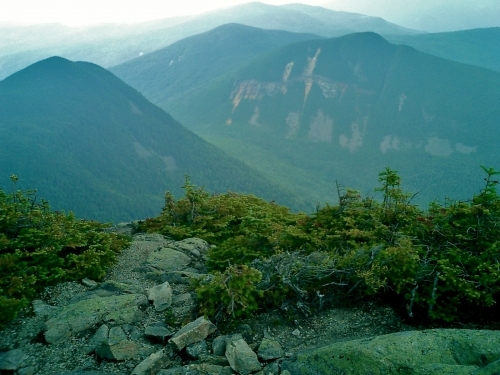 Abraham is totally new ground for me- one of the few 4,000 footers in New England that I have not yet hiked. Here’s 4 minutes of footage of the hike, with Alisin of One-Minute Hike fame! She completed her hike to the summit on Aug. 7. Goodreads | Tom Jamrog (Lincolnville, ME)'s review of Where the Waters Divide: A 3,000 Mile Trek Along America's Continental Divide. I’m planning my own 2013 CDT thru hike and am currently devouring maps and books like this. It is hard to believe that since 1993 , when this book was first published, thru- hiking this LONG trail was estimated to take 6-8 months. Now, hikers are making it in around 5 months. Better, lighter gear, and the knowledge that it can be done, are the reasons. Also it is much easier to obtain the maps and general information. The authors wrote hundreds of letters to rangers, supervisors, and forest service officers. No one does that anymore. So far, I have spent over $500 on maps, but only needed two addresses to get them, and I did it all over the Internet. The writing here is good. The suffering level is high. The authors didn’t make it out of Montana at the northern end before the snows hit in October, and resorted to road walking the last several hundred miles before reaching the border on Nov. 2. There were no GPS devices to help them, as there are now. It is interesting that the same complaint they had throughout the book about poorly marked trail is the case now with present day hikers. There’s not much data here about practical matters like the specific gear they had with them. They were hiking in heavy boots with thick socks, so blisters were a real issue. They prepared 80 boxes of food and supplies that were mailed to themselves at 30 resupply points. They tried to maintain a 15 mile a day average, even through Colorado, where the trail averages at 11,600′ in elevation. 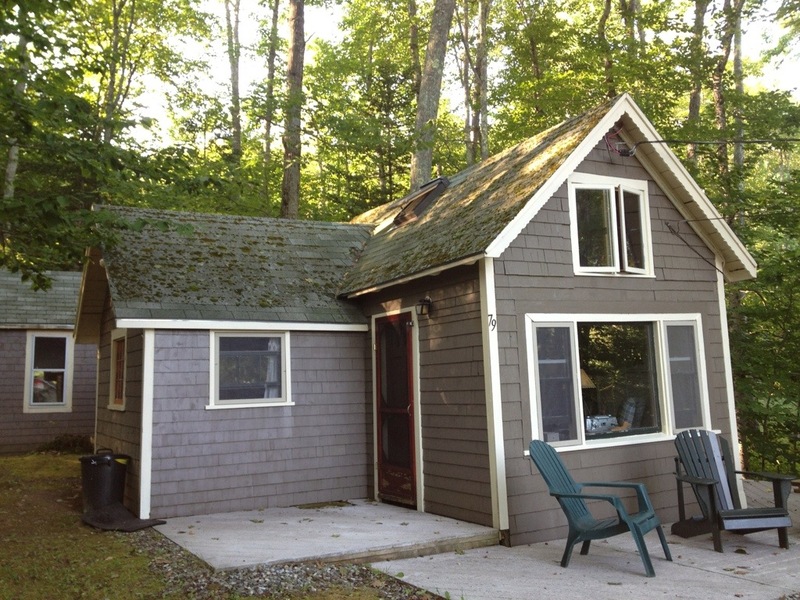 I The sound of fall is already here-acorns bouncing off the roof and the deck here overlooking Hobbes Pond in Hope. We’re ready to take out a couple of Keowees for a paddle down by the cove this morning, checking for turtles and herons. I have already waked 5 miles up and back from Pushaw’s Trading Post, where I bought the Sunday paper. 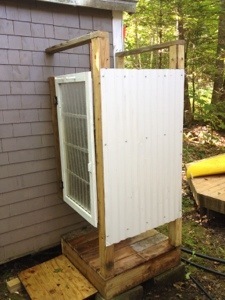 When I came back, I was drenched from the humidity, but this time I enjoyed my first ever hot shower from the outdoor “rinsing station” that was one of several recent additions to our deal here. A great start to a Sunday just a short bit away from home. It’s cool to do, plus you will literally cool off. Marcia and I parked down by the end of the Samoset and packed in a lunch and spent less than an hour on this most amazing hike. You walk over an absolutely straight, flat, 7/8 of a mile highway out to a lighthouse. 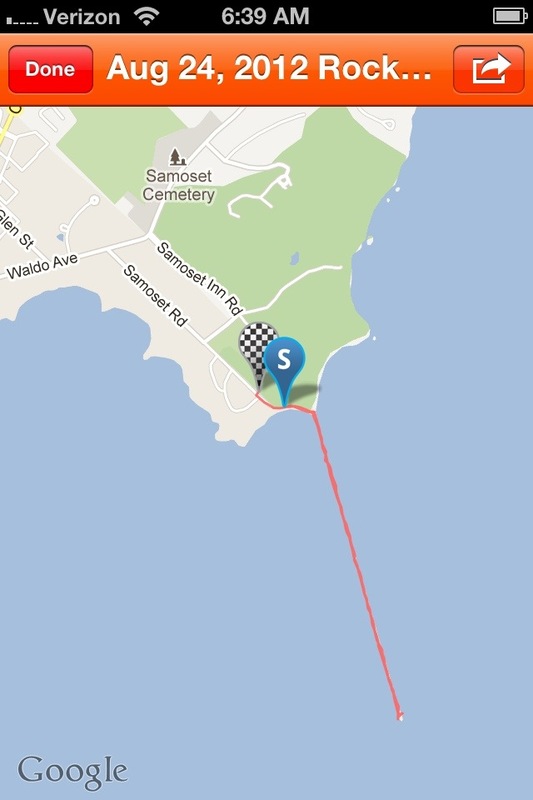 With the sun out , we saw down into the green water, and watched sailboats and working lobster boats glide by. There was even ample shade for us to eat our lunches as we sat on a Weatherend bench and gazed back out toward the astoundingly beautiful coast of Maine. They lasted me 10 years. Wearing these glasses made the world crisper and clearer than real life. The secret to having them so long is this- a hard shell case! This past April, I was at a music festival in Austin, TX when I left them out of the case, and they slid beneath the passenger seat of a rented car, where they ended up with a broken lens.I was devastated, but felt that I had my money’s worth. 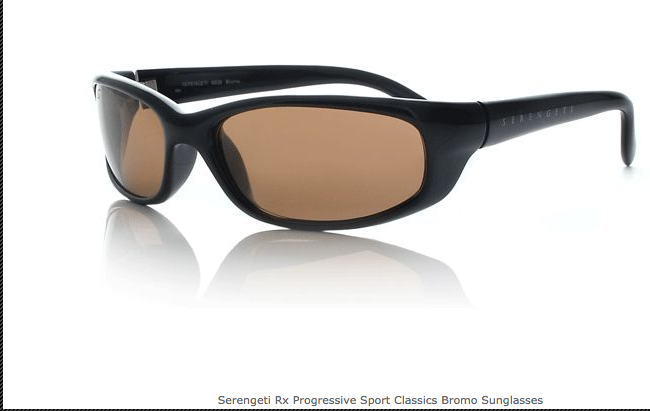 I contacted Serengeti about the cost of a replacement lens, and was informed that the company had been purchased out of New York by Bushnell. Bottom line- Bushnell requested I send them the glasses for inspection. Check. I then received a post card informing me that since they were out of warrantee, they could be repaired for $40 plus $5 shipping. Knowing that they would likely cost over $150 now, I decided to go for it. Two weeks later, I received my glasses in the mail, and was stunned to receive what appeared to be a brand new pair of sunglasses, appearing exactly the same as my old ones. Except they weren’t new- they were my own glasses, completely reconditioned. I recognized the same worn lettering on the side, but these had TWO new lenses, and new hinges, and even the plastic housing around the lenses had been put through some type of machining process that smoothed out the glued crack that I repaired back in 2007 on a winter trip. So, here’s one example of great service from a US company. Thanks, Bushnell! 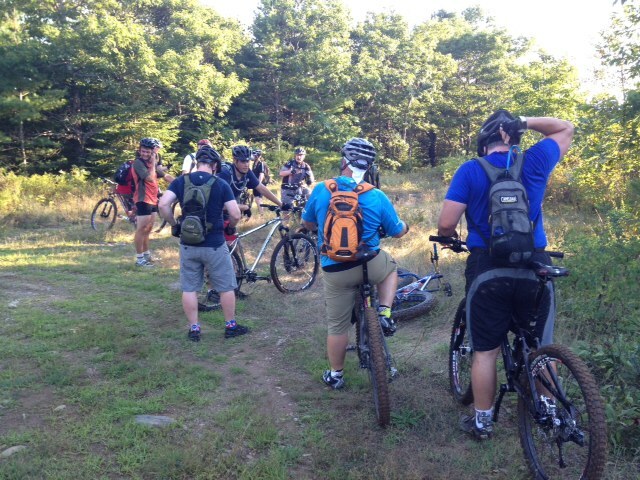 A record tonight for the number of riders in The Rockland Bog- I counted 17 guys milling around in the parking area off Bog Road after the ride, which happens every Tuesday night- year round, snow, mud, or heat- as if has for almost two decades now. Most of the faces are the same, but the bodies are a bit thicker, hair grayer, and the bikes lighter, faster, more comfortable, more able to handle the ribbon of rocks, roots, and grit under our wheels. Are the bikes more dependable? The Bubbas are famous for being hard on gear- the number of frames that we have broken has reached double digits- with me contributing to that category as well. It’s incredible that we rarely now have members that have ” mechanicals” out there any more. It used to be a standard practice to interrupt a ride to replace or adjust drive trail components. Now, even flatted tires are rare. The bikes are better, and maybe we are also better riders- we sure have had chances to practice! I rode well again tonight, finally clearing the long section that started on the Highland Path, past the power line, back into the woods, and across three woods roads. I am riding better than I ever have, partly by losing 10 pounds of body weight since April, but mostly due to the almost magic properties of my Santa Cruz Tallboy with those big 29 inch tires and VPP rear suspension system. I think it is mostly the bigger tires. I have the same ability to roll over difficult terrain and climb more easily on my Surley Pugsley, whose 4″ wide soft tires are nominally 29″ in diameter. Here’s a pic of Ian on his Mukluk ready to attempt leaping from one log to the next and riding it out. He didn’t make it, but he tried. 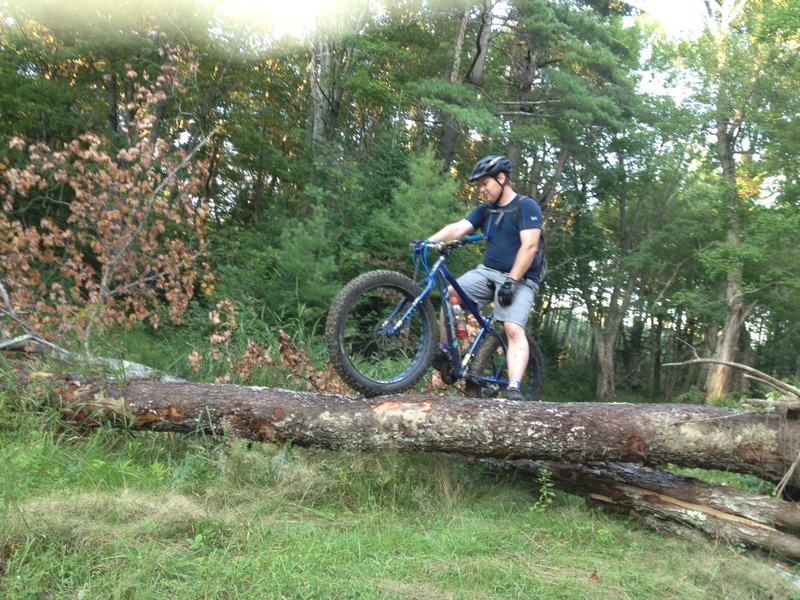 It is also coming on to the best time of the year to ride here in Midcoast Maine- early fall, before the days get too short and the rainbow of foliage drops from the hardwood trees and blankets the trail, making it harder to follow, and camouflaging some of those knock-you-off your bike obstacles that are normally visible. 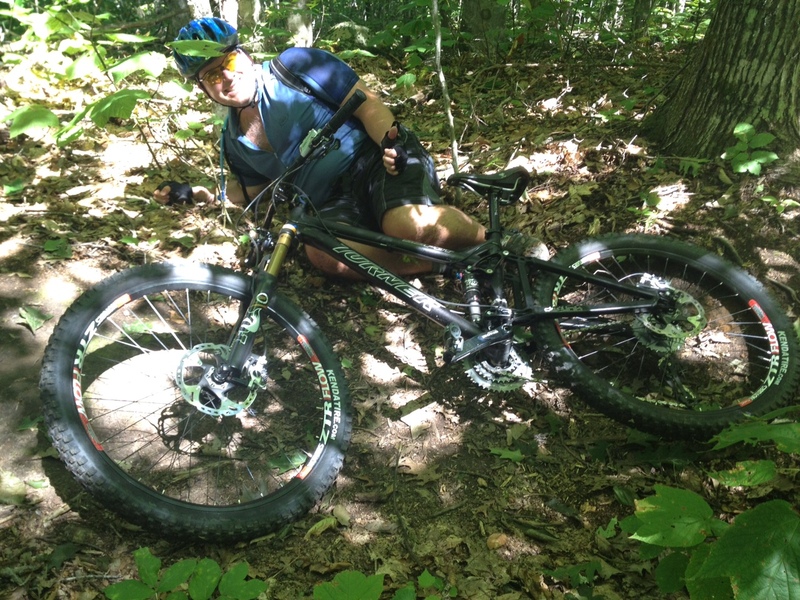 Here’s a shot of Craig on his newly assembled Turner, who managed to roll off the trail a couple of days ago while we were riding Five Brooks’ on Ragged Mountain. He’s smiling! Nelson on the Turner- Bubba down! Big day hike in the Whites. First, about the New England 4,000 Footers. This is an official list of mountains in Maine, New Hampshire, and Vermont that reach or exceed 4,000 feet in elevation. There are 67 on the list. I have less than 5 left to go, after picking off the rest of Vermont last August on my Long Trail thru-hike. I am now quite interested in finishing up, possibly before winter. Mount Carrigain is on that list- at 4,710′. 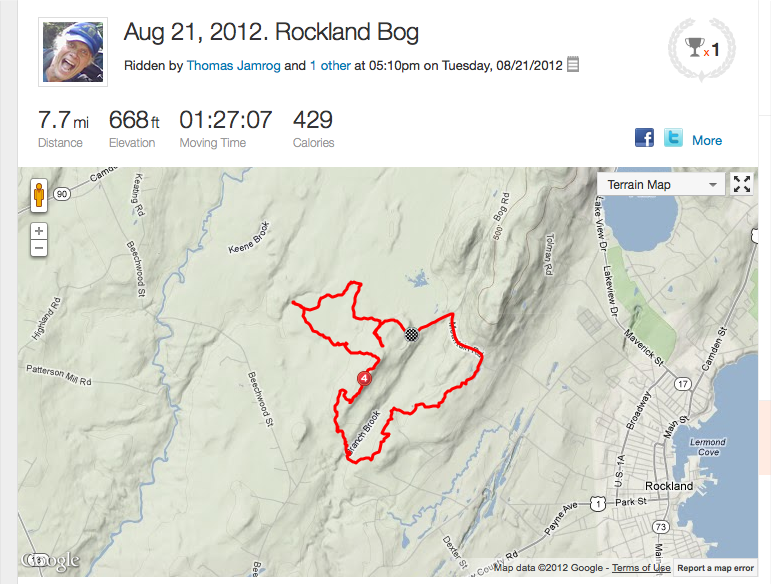 Normally a 10 mile up and back round trip, it was 14.7 miles today. 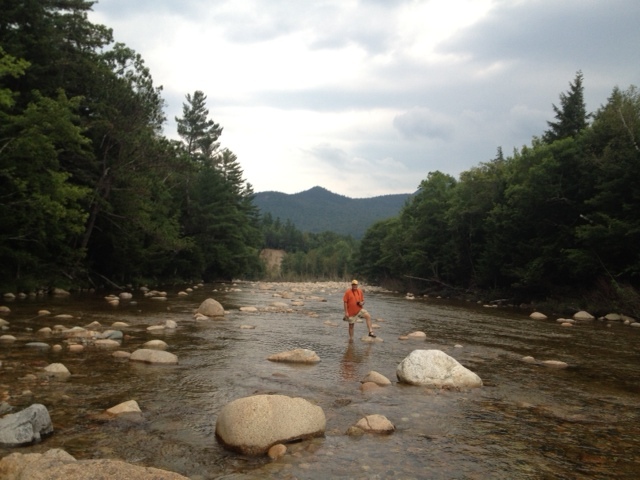 The additional mileage consisted of walking back to the car after a night camping at Fourth Iron on the Saco River, plus the 4 miles of road walking on the Sawyer Pond Road, still gated after major washouts from Hurricane Irene last August. Hikers need to know about Fourth Iron. The tent site appears on the map enclosed in my AMC New Hampshire Guidebook, but with no printed mention of it in the Guidebook itself. The parking area is about 3 miles west of Bartlett and leads to a hike-in group of 8 maintained tent sites, less than a half-mile, walking on flat-ground-to-get-there, off Route 302. All the sites ($8, USFS Honor system) were taken, so we meandered down the side of the Casco River until we found a most excellent spot that allowed us to roam around in the river. My partner for this hike was Tenzing, aka John Clark, who spent the night in his new LLBean solo backpacking tent, while inside his new light weight sleeping bag, and on top of his new sleeping pad. Our dinner was comprised of us splitting one US Army dehydrated Enchilada MRE dinner, complete with all the fixins’. Plenty of calories for that to go around. Later, we had fun hanging our bear bag on a limb overhanging the side of the water. Big night for Tenzing and I both- to be resting aside the infant Casco River as it gathers momentum after descending in rivulets from the high flanks of the mountains surrounding Crawford Notch. We were up at 5:30 AM and only had to move back to the car and drive it across the street to the parking area at the base of the gated Sawyer River Road. Those “in the know” had brought their bicycles with them to pedal up ( and coast 2 miles back) on the gradually inclined gravel road to the official start of the Signal Ridge Trail, which is now rerouted at the start and a short distance up Whiteface Brook, due to the massive logjams and washouts from Hurricane Irene ( 2011). 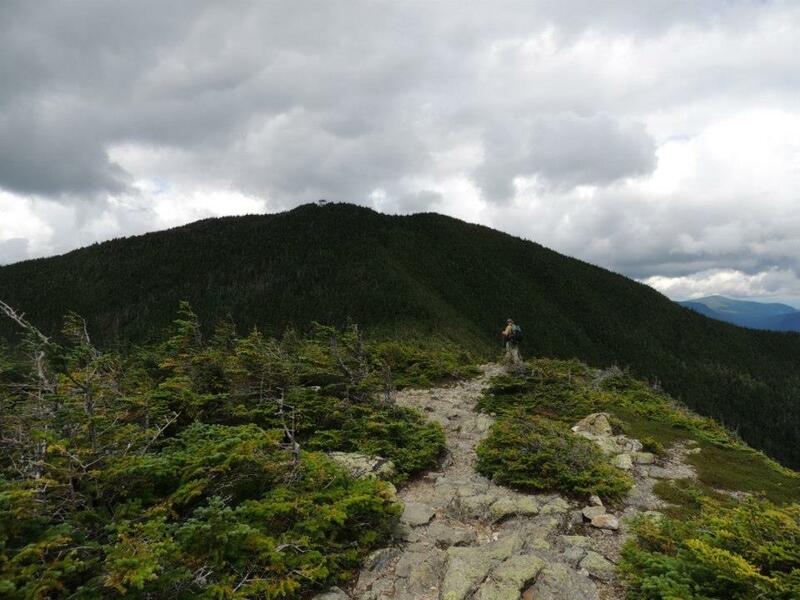 The trail is a gradual 1.7 mile hike up to the intersection with the Carrigain Notch Trail, where it continues itself over Carrigain Brook, eventually reaching 3 miles of steady climbing to the actual exposure of Signal Ridge, where the views just keep on coming. The end is now in sight, with the outline of the squat firetower ahead. On the way up, you pass the site of the old fire warden’s cabin, which would have been a peach of an assignment back in the day. There is ample water there in a boxed wooden spring. We reached the top at 11:30 AM, with views all the way to Washington in the east, to Franconia Ridge to the West, and all the way back south over the Kangamangus Highway to Mt. Chocorua. The Appalachain Trail and North and South Twins were to the north. A large pile of pressure treated lumber and beams were on the ground, ready for a rebuild of the Firetower, the project starting this week, when access to the tower would be limited. We passed just one lone hiker on the way up, who was finishing his New Hampshire 4,000 Footer list today. 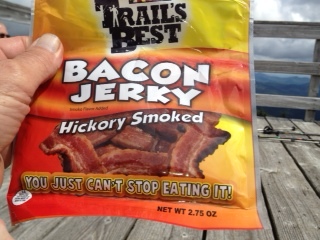 I took off my shirt, boots, and socks while relaxing on the deck of the tower, while I enjoyed what may be the best trail snack I’ve even had- Bacon Jerky ! A steady stream of hikers began to join us after 12 PM, when we gathered our gear and headed down. Surprisingly, it took us just about the same time to descend the first 3.3 miles as it took us to go up, due to the constant jumble of which-way rocks and crossways roots that made up the ancient trail. I wish I had my bike waiting for me at the intersection of the Sawyer River road, so that I could have cruised back down those last two miles. They went on forever! The Minimalists | Organizing Is Often Well-Planned Hoarding. After cleaning out the garage, I still don’t have enough room in there to suit me. I’m also emptying the ” shed”, an outbuilding that has been nothing more than an embarrassment to me for the past two years. Handling ultra-slimy and grimy open containers of dead fly/used motor oil, and despicable loose batts of 35 year old fiberglass insulation suits my penance. It’s so hard to move along stuff. But I’m doing it. The skies are finally clearing and I’m headed over to the Whites today to rendezvous with Tenzing, my hiking buddy, for a night of camping, and an ascent of Mt. Carrigan, one of the mountains in the New England 4,000 Footer Club that I can cross off. I only have less than a handful to do. Photo by Aislinn Sarnacki. 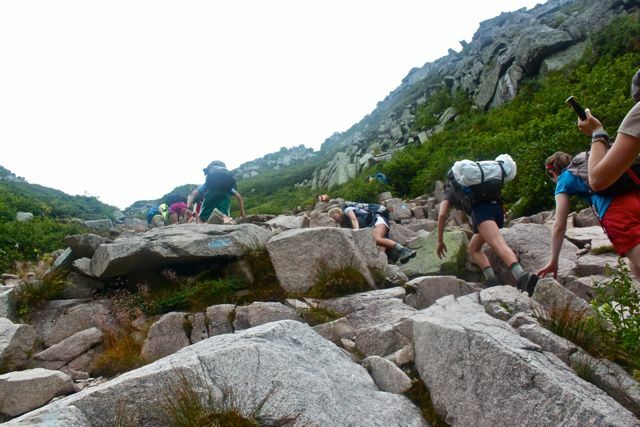 The group of 10 teenagers participating in the 2012 Maine Youth Wilderness Leadership Program hikes up Saddle Trail to the summit of Mount Katahdin in Baxter State Park on Aug. 10, 2012. Today’s Bangor Daily News has a good reference to what is probably the easiest trail up from Chimney Pond to Baxter Peak- relatively easy. I like the inclusion of the video. This youth group was hiking at a good clip, and the fact that it was hailing, and socked in with clouds on top, indicates that hiking is often undertaken in less than picture-post-card conditions. I have two reservations for Baxter State park coming up. 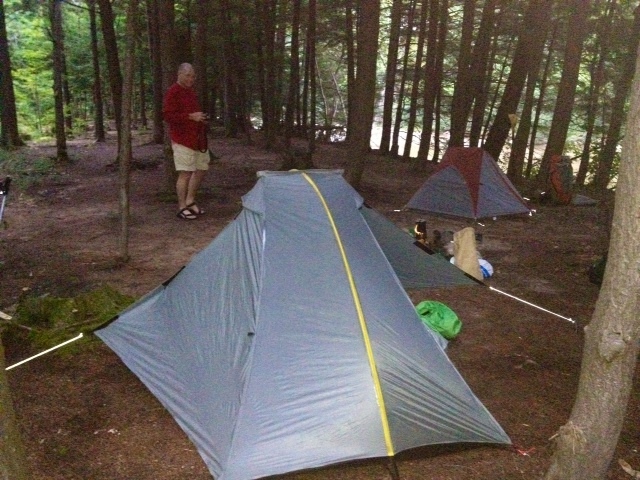 In a month, I’ll be camping at Chimney Pond for two nights, where our Gang of Four hopes to make it to the top. It’s likely that we’ll take the Saddle Trail up or down. 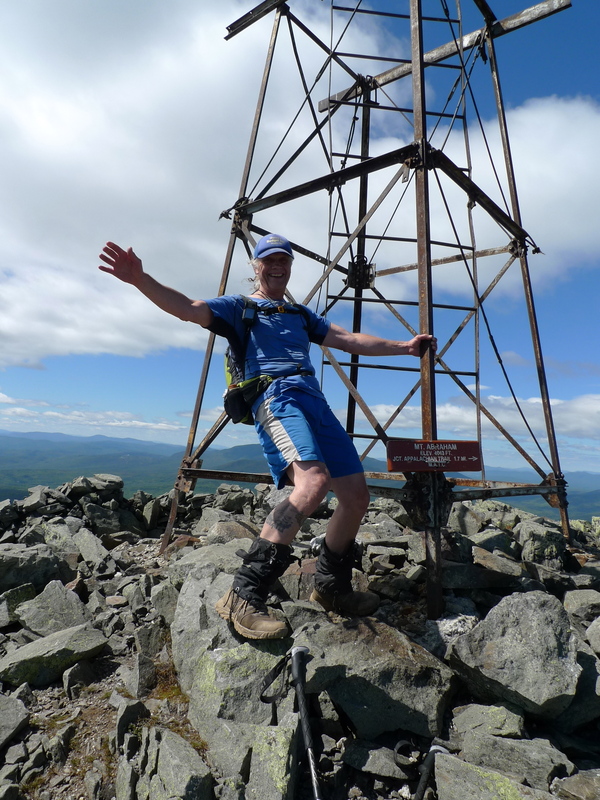 1-minute hike: Saddle Trail, Mount Katahdin, Maine – Act Out with Aislinn – BDN Maine Blogs.